This big, noisy streamer leaves no stone unturned, with hard disks available in various sizes (500GB to 2TB, or add your own). AC Ryan has also put a good quality braided 1.8m HDMI cable – along with many others – in the box. Our 1TB review sample didn't come with built-in Wi-Fi, but an 802.11n USB dongle is available for a further £30. That seems Scrooge-like at this price point, though it's not that unusual in this market. The same goes for the cheap remote, although on aesthetic terms its black, green and blue video navigation buttons lift it slightly above 'afterthought' status. Luckily, things improve when we get to features. 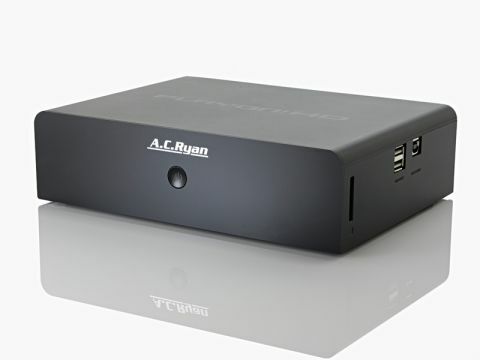 The device's heavy-duty feel carries continues in the performance, where the PlayOn HD boasts exhaustive media compatibility – card slots are dotted around its bulk, along with three USB ports. Other rarities lie within; the PlayOn acts not only as a NAS drive if networked, but also as a direct download BitTorrent client for acquiring files. Legally, of course. The UI compares reasonably well to its rivals', with a basic presentation of file lists for USB sticks and UPnP sources jazzed up by a large preview screen that comes to life if you roll the cursor over a video file. We had no problem streaming a host of lossless music files, while video compatibility is also huge. As well as supporting WMV9 files, the PlayOn can play Real Networks files, such as RM and RMVB, up to 720p. The PlayOn is also available as a 'mini' version (around £90) that does away with the hard disk and memory card slots. If you want it all in one though, this is an excellent choice.